Sussex Forklift Training offer training on the 2 most commonly used machines, the Mobile Boom and the Mobile Vertical. The Mobile Boom, previously known as a Self Propelled Boom, come in 2 main varieties, Telescopic Booms and Articulating Booms. As well as variations in lift heights – up to 150ft (45 Metres +) both access platforms can be powered by Diesel, Gas (LPG), Electric, Bi-Fuel. Both can be 2 or 4 wheel drive and are idea for rough terrain use. A type of lifting platform that can only move vertically and when fully extended can reach heights from 21 to 62 feet (6.4 to 18.8 meters) above ground depending on its size and purpose. It is drivable at full height with an extending platform. The course qualifies the candidates to operate Spider Lifts, Vehicle Mounted and Trailer Mounted MEWPS. These machines are driven or pushed into their working position and will then elevate to various heights when the stabilizers (outriggers) have been deployed. 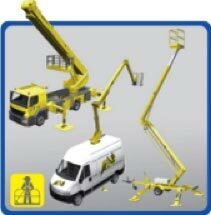 Unlike the Cherry Pickers and Scissor Lifts these machines cannot be repositioned when they have been elevated into position.